This Elstead Hereford traditional grande outdoor up wall lantern in black with clear water glass and rated IP43 features traditional country style. Part of a collection of outdoor lights typically seen in the heart of country villages. 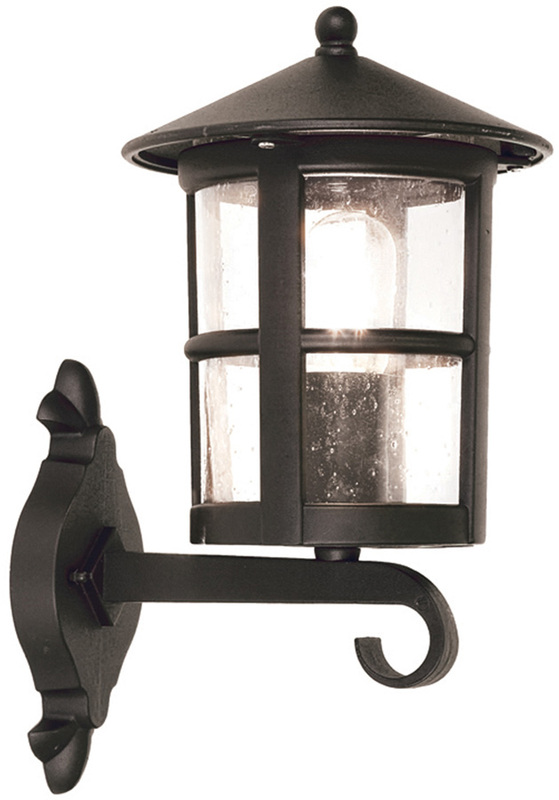 Lovely larger size exterior wall light constructed from black finish cast aluminium, with heavy scrolled wall mount and lovely upward facing, square windowed, clear water glass circular lantern. Alchromated for extra durability with a five-year anti-corrosion guarantee. This exterior light is supplied by Elstead Lighting, a British company that specialise in the manufacture and distribution of quality decorative lighting such as the Hereford traditional grande outdoor up wall lantern in black with clear water glass and rated IP43 you see here.